I am very excited to be guest hosting #CookBlogShare this week! I’ve been sharing my recipes with CookBlogShare ever since I started my blog just over a year ago so it gives me particular pleasure to be guest hosting this week. Regular hosts Kirsty from Hijacked by Twins and Eb from Easy Peasy Foodie do a brilliant job every week (as did Jacqui from Recipes Made Easy who guest hosted last week) – with all the fabulous recipes participating in the linky it’s really not easy to decide which ones to feature, as I’ve found out this week. Goat’s Cheese and Asparagus Salad by Mrs Portly’s Kitchen is fabulously simple and appealing, featuring asparagus, in season now, ingeniously paired with tangy goat’s cheese. This lovely salad comes with a simple honey mustard dressing and toasted hazelnuts for a bit of crunch. Can’t imagine a better way to celebrate asparagus season! Tomato, Black Olive and Goat Cheese Galette by Claire from Foodie Quine is a delicious, easy to make light meal idea full of wonderful Mediterranean flavours. Claire has used sweet and delicious Scottish baby plum tomatoes in this recipe, which I’ll definitely be looking out for next time I am grocery shopping. I love the addition of the smoked paprika! The classic lunch idea – soup! Jerusalem Artichoke Soup from Lost in Food is another delicious seasonal recipe! There is nothing more satisfying than cooking with ingredients you’ve grown yourself and Lesley has made this soup using her own Jerusalem artichokes. The recipe is everything great comfort food should be – hearty, filling and delicious! Cauliflower Chilli Con Carne from Mummy Mishaps is one of the healthiest chilli recipes I’ve ever come across – it’s low in fat and full of delicious cauliflower (along with other fabulous vegetarian ingredients). This is a slow cooker recipe – super convenient and ideal for busy people. And it sounds absolutely delicious! Last but certainly not least, is Easy Peasy Foodie‘s Spinach, Cauliflower, Quinoa and Chickpea Curry. This tasty and nutritious gluten free one-pot vegan curry dish comes together in under 30 minutes! So it’s quick, convenient and super healthy too. For me this is an ideal lunch or dinner recipe (both actually – I’d make it for dinner and enjoy the leftovers for lunch the next day!). 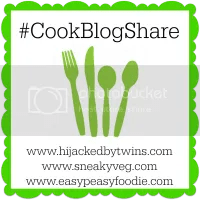 Link up your recipe, sweet or savoury, or any foodie post to the CookBlogShare linky party – just click the blue ‘add your link’ button below and follow the instructions. It’s back to the usual hosts Kirsty and Eb next week (2 May). Hi Monica, Nice to meet you. Awesome vegetarian recipes. I am vegetarian and I share only vegetarian recipes on my blog. Tanks for hosting the lovely party. Hi Monica, I have shared my tropical chutney that will go well with these easy vegetarian meals. Thanks! I know what you mean, it’s not easy when everyone in the family likes to eat different things. I really should have eaten lunch before coming over here. A great selection of recipes! A great selection of recipes and thanks for much for including mine! Lovely to meet new people in the food blogging community to be able to enjoy the fruits (and veg) of everyone’s labours. Enjoy your week in the hot seat!